"New World" does not necessarily mean without tradition: the family Osborn founded the winery d'Arenberg more than 100 years ago in the Australian McLaren Vale. Originally, Port-like wines were produced for the English market. In 1959, Arry Osborn founded the Arenberg brand, named after his mother's maiden name, Helena d'Arenberg. 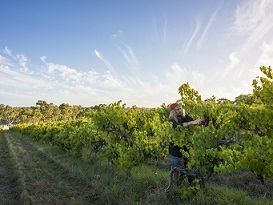 Since 1984, Chester Osborn has taken over the estate, which has established itself over the last decades in the absolute top league of the wine producers of Australia. In addition to dry white and red wines, the port-style sweet wines still play an important role in the wine's assortment. The production methods are very traditional, they try to produce as natural as possible and do not use any fertilizers. James Halliday, the most important wine critic of Australia, awarded d'Arenberg the highest rating of 5 stars for the 13th time in a row.